Today on 24 Days of a Baltic Christmas please welcome my grandmother Ilze; longtime reader, first time contributor! There were candles, special small white candles for the trees, sometimes also in different colors. And there were special candle holders that were made to securely fit on the tree branches, which were stored year to year together with the tree ornaments. 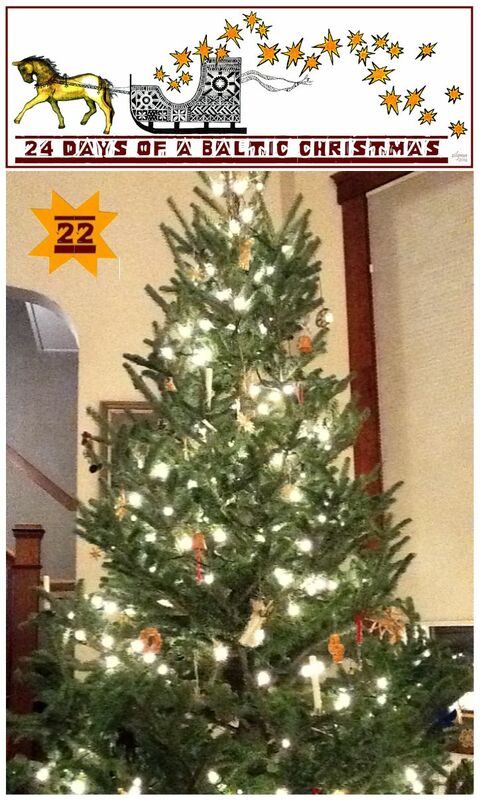 The family Christmas tree – freshly cut – was set up early on Christmas Eve in the living room. Always a tall tree, reaching up to the 10ft ceiling. Decorated with ornaments, handmade or store bought, elaborate heirlooms. And the small candles, many, many candles. Was it dangerous? Yes. There was one Christmas Eve, I was probably 4-5 years old, when my grandpa walked between the tree and the window and the sheer curtain touched a candle and suddenly went up in flames! I remember screaming and was taken out of the room, and do not know how the fire was extinguished. But later that evening things were back to normal, the candles were relit, we were singing and the children had to recite their poems or perform a piano piece. 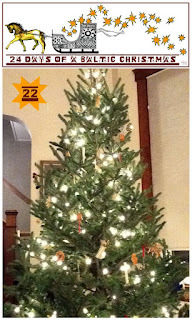 I still have a tree every year – a live, “real” Christmas tree – in my living room. It is trimmed with ornaments and strings of lights. But I always have a few candles in it. 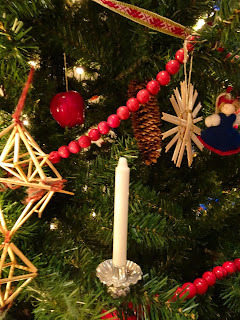 On Christmas Eve for a brief moment the electric lights are turned off and the candles lit. If only for a few minutes, we let the glow of the candles in a tree spread the magic and warmth of Christmas that only candlelight can give. As we approach the end of the 24 Days of a Baltic Christmas, I wish each and every one of you a few moments of calm in your holiday bustle, and the simple pleasure of the warmth of candlelight on these dark winter nights. Enjoy your final svētvakara preparations, and we'll see you tomorrow on Day 23 of the countdown!